we had a great time celebrating the fourth of july with a family cookout at my parents' house over the long holiday weekend. 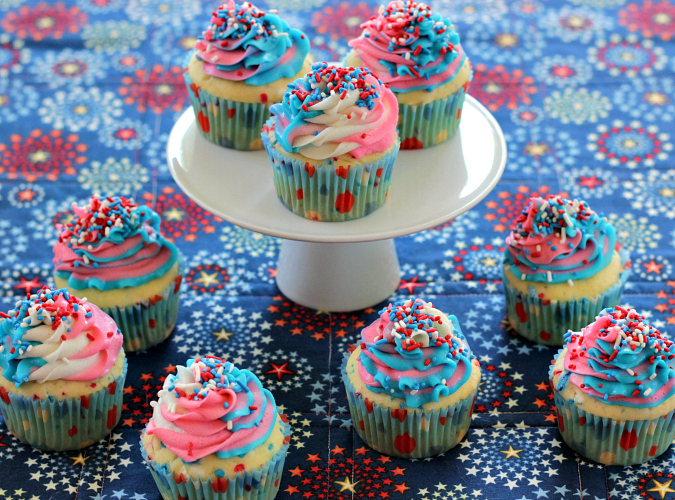 for dessert, ryan and i made patriotic confetti cupcakes. confetti cake is always so festive and fun. 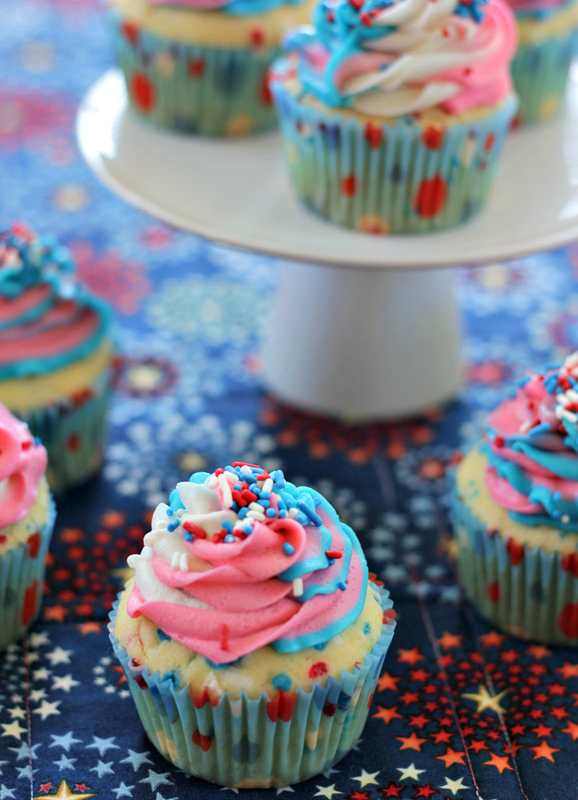 we've made rainbow confetti cake and cupcakes in the past for other occasions, so when i realized that we had a container of red, white, and blue sprinkles at home i thought they would be perfect for our fourth of july dessert. 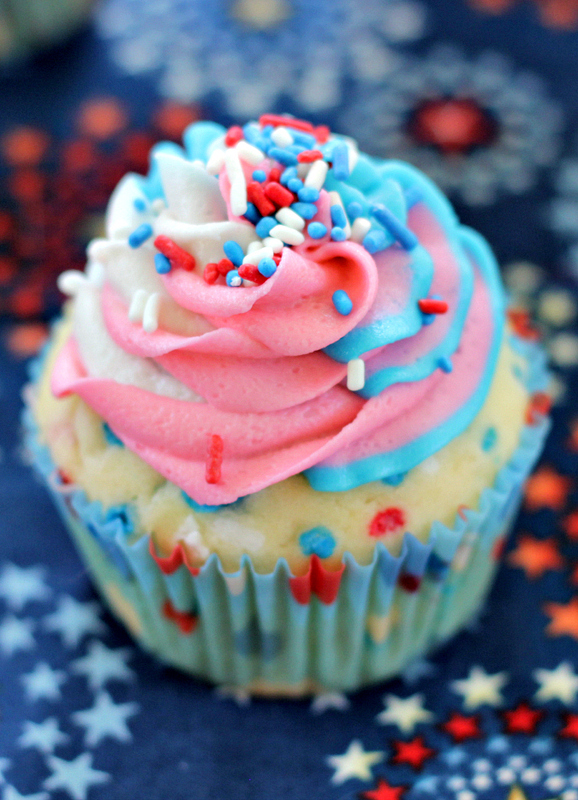 paired with these cute red, white, and blue polka dot cupcake liners and our red, white, and blue swirled frosting, they were extra patriotic! these cupcakes have a great subtle almond flavor. 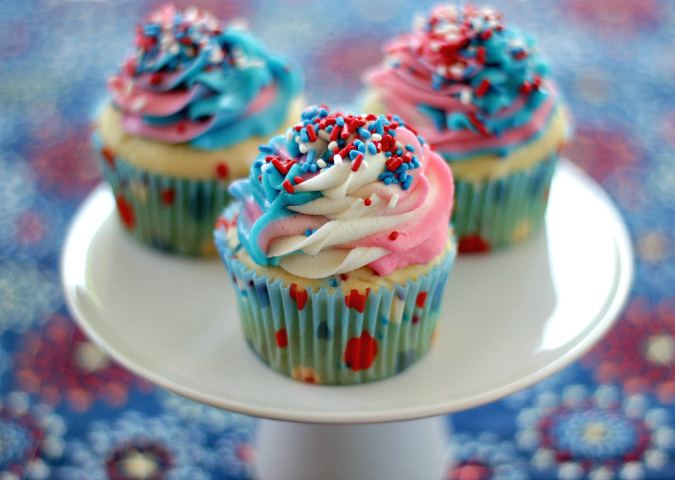 even if you don't want to make these cupcakes red, white, and blue, this recipe is a great basic almond cupcake recipe for any occasion which can be decorated to fit your theme. to make the cupcakes, preheat your oven to 350 degrees F and line a muffin pan with 12 paper cupcake liners. in the bowl of an electric stand mixer fitted with a paddle attachment, cream the butter until soft (about 2 minutes). add the sugar and beat until light and fluffy (about 3 minutes). separate the egg yolks from the egg whites. add the egg yolks, one at a time, beating well after each addition. beat in the almond and vanilla extracts. in a separate bowl, sift the flour and baking powder together. add the dry ingredients to the mixer alternating with the milk until combined. in a separate bowl, whisk the egg whites with a hand mixer on high speed until foamy. add the cream of tartar and whisk until stiff peaks form. gently fold the stiff egg whites into the cake batter with a spatula, being careful not to over mix and deflate the egg whites. once combined, fold in the sprinkles. evenly divide the batter between the 12 cupcake liners. bake for 15-18 minutes, until a toothpick inserted into the center of the cupcakes comes out clean. remove from the oven and allow the cupcakes to cool completely before frosting. to make the frosting, in the bowl of an electric stand mixer fitted with a paddle attachment, cream the butter until soft (1-2 minutes). add half of the powdered sugar along with the milk and vanilla. whisk until combined. add the remaining powdered sugar to reach desired frosting consistency. 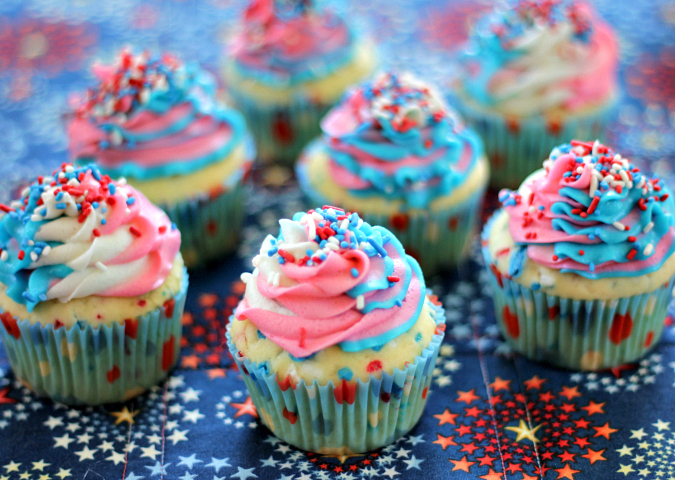 These cupcakes had a good flavor and they look really pretty sitting on the patriotic tablecloth. The cupcakes were delicious and very festive.